Okay...now it's my old musical friend Eric Taylor singing Blue Piano. He deserves his own thread to be sure and I always highly recommend him. Next to Townes van Zandt was this guy Eric Taylor singing what I consider to be one the best songs ever written. Found only on an old compilation LP from Anderson Fair in Houston, Tx. He was once married to Nanci Griffith and her excellent live album from Anderson Fair in Houston, Tx. has yours truly in the audience and featured on appreciative loud whistling in several places. I saw Eric in town recently and asked him about Virginia's Photograph. He told me he was going to have to relearn those old songs and start playing them again. His new record is excellent. Eric Taylor should be considered a national treasure. Now old Joan Armatrading " Baby Wontcha Come On Home "
I'm home...and feeling years and years younger to be sure. Paddy - this is getting spookier by the day! We have a video (have had it for years, in fact I bought it for Richard's birthday one year) of the Nanci Griffith concert at Anderson Fair........so you were in the audience...small world huh? Can't say yes for sure...... It's possible Nanci appeared there many years after the Live CD and decided to video that show for release. Do the liner notes happen to give the date...? To my knowledge....the show we attended that turned into the Live from Anderson Fair LP and cassette and I guess now CD was not being videoed. Nanci and Tim are old buds and I can see them lining up a concert to be taped for Video release......I'm guessing it was years and years later. Track Listings would help as well to narrow it down. I'll not ask you to go find them......instead I'll look around the web to see what I can find. We were front row center for the second show and so help me I cant recall if we attended the first show earlier in the evening. Nonetheless my whistling is prominent on a few tracks. If these are in fact the same concerts that would be too funny and you're right, a little spooky! One Fair Summer Evening - - is the title of the concert release to LP. Live at Anderson Fair might be the release on Video you and Richard have. Early returns say these are different shows...I'll keep you posted on my finds. We'll look out the video at some stage - I always joke to people that whichever cupboard you open in our house CDs fall out of it so may take a while to track down. We knew that Nanci Griffith was on in London but we are otherwise engaged on the 1st - something to do with a birthday dinner a deux! She has been a regular visitor and we have seen her a good few times, in fact at one stage she was the person that we had seen most often in concert but has been overtaken by Tom Russell. Whew!!! And I thought I was the only one on the board who has music stashed just about everywhere you look. Figured most folks have a nice orderly place for their CDS. I gave up on that years ago. It would be interesting to hear from others on how their music is or isn't kept around the house or workplace in order to gain ez and instant access. My most recent attempt was to separate music into Boys/Girls/Bands. Funniest movie capturing the OCD of music collecting? Two come to mind for me......can anyone think of one? According to DVD Movie Central, One Fair Summer Evening was recorded at Anderson Fair in August 1988. See video review at the link below. Karen, thanks for the link to the DVD of the concert at Anderson Fair in 1988 to which I can now say to Jela, yes, I was there. I'm on the lookout for the eventual release of a documentary being put together now that is about the history of this fine, fine folk venue. Many a fine songwriter today went from audience member, learning the ropes from their musical heroes onstage at Anderson Fair, to stage performer. I think that will be part of the story being told. I found Jimmy relatively late. He had already released several CDs when I first found him at my first WoodyFest in 2001 (the year Texoma was released.) I have about 25 CDs that never leave my car - Texoma is one of them. Can't go wrong with it. He does a balled "never a moment" that is probably one of the most beautiful songs ever written, but you'll also hear him rock out on Bob Childers' "Elvis loved his Momma". He also does a spine-tingling version of Gretchen Peters' "on a bus to St. Cloud" (made famous by Trisha Yearwood) and a cover of Dylan's "ewmotionally yours" that makes me appreciate Dylan and ends with Jimmy Webb's "the moon's a harsh mistress". Over the top. Interspersed throughout the 16 tracks is classic Lafave...from the opening track "bad bad girl" to "this glorious day" to his anthem to Woody Guthrie, simply titled "Woody Guthrie". One of my all-time favorite CDs. Great Piece on Jimmy Lafave and wise move on giving Texas Artists their own space out here. I was a little worried that WUMB might get lost in the shuffle with all my enthusiasm for singer/songwriters from Texas. I recall the popularity of the Texhoma record when new and at one time did the instore headphones trial listen ( a bad idea imo ) and it sounded good but I was into so many others at the time that I passed then and never went back. Think I'll have to soon. The same has happened with The Subdudes....high praises from all, still don't know much. After the show in Ogunquit, during our extra special after show meet and greet with Ellis ( Thanks again to Ellis and Flynn for that ) I asked Ellis if he knew of any other song that had armadillos featured......to which he answered that he had not. I said that I had and it was by Robert Keen. He said he loved Robert's song The Road Goes On Forever and I had to agree....great song. So, this one's for you Ellis. The Armadillo Jackal....... by Robert Earl Keen, Jr... It's on his very first record titled No Kinda Dancer. I have been a huge fan of Mr. Keen's since the very early days of his career when he used to play Anderson Fair on a regular basis. A note of warning about his song paying homage to armadillos....it is not for the squeamish......The talking intro to the song was just so spot on scary and set the mood just right for what was about to transpire out on Farm to Market Road 391 as the storie's main character was warmig up his 1964 Dodge Valiant with the push button transmission. The Album version doesn't include the story, but hopefully there is a recorded version of him playing it Live with intro. If not, and yer ever hangin out with him drinkin beers, that would be the song to request......and tell him he just HAS to include the intro. I love that song, Paddy! It sounds so ominous, I always end up rooting for the armadillo. Ha! Never knew there was an intro... maybe we can track down the story on-line somewhere? Wendy, that's funny, you do want to root for the lil guys don't you? The intro was short and sweet as Robert began playing guitar, you knew, you just knew what was coming. For about a minute or two Robert would talk intro the scene of the guy gettin ready to go out again and do what he had to do for a living. The audience was both scared and in stitches at the same time. Robert was a film major in college and just had this way of painting the scene just before the song told the story. The really unique thing about the song ( it's in first person ) is that you had the true feeling that Robert was the guy out there driving the car. And Robert seemed to take on this guy's maniacal quest as tho it were his own. ps - Wendy - I'm guessing you're quite fond of the song "Willie"....as well. Oh my gosh, that fish just keeps bigger and bigger with every telling doesn't it? The song is actually 5 lb bass and the stories he used to tell in the middle of that song in concert were Classic Robert Keen Humor. How one time they fell asleep the night before a big fishing trip and the pipes had burst in the apartment they were in and they awoke to 4 feet of water in the place and things floating around everywhere. paddyinthepub wrote: Okay...now it's my old musical friend Eric Taylor singing Blue Piano. He deserves his own thread to be sure and I always highly recommend him. Blue Ruby Music & Records is excited to announce Eric Taylor just finished recording his 6th studio album, HOLLYWOOD POCKETKNIFE. Recorded at Rock Romano’s Red Shack in Houston, Texas, and produced by Taylor, HOLLYWOOD POCKETKNIFE is a stunning collection of 7 new songs and 3 surprising covers from an artist hailed by critics as one of the world’s greatest living songwriters and performers. Thanks for the heads up, Herve. Eric taylor is one of the best out there, there's no doubt about it. And yet, so little draw when he came through the Philly area earlier this year. I mean 25 people in the whole place (Steel City Coffeehouse in Phoenixville...great venue, nice follks) and Eric had to stare down some loud talkers a couple times. He appreciated the folks who came out and said something kinda funny about coming back next time he's there only bring a friend. He was awesome as ever. He spoke alot between songs, really set the picture and mood. Lots of back stories, the time he went in search of some really famous, yet obscure old black blues player living down south somewhere during the 60's, Eric Taylor is about 16 living near Atlanta and he hops in a car and drives hundreds of miles in search of this guy...and FINDS HIM, no less. Guy had a wooden leg he used as a pillow at night...Eric spent the better part of 2 weeks with the guy and just picked the guy's drunken brain for all kinds of stuff related to the blues and blues music and in his concert he's taking you back and I swear ya felt like you were in the room with the two of them. Eric said he needed to go back and learn some of his early stuff, sure hope he does. If I were to go on a musical mission, I would try to do 2 things. 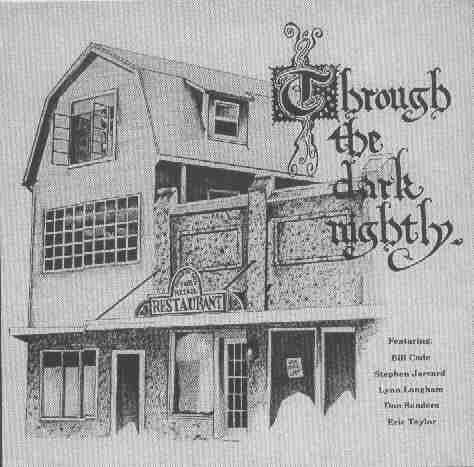 First, find an old copy of my favorite Eric Taylor song ever, put out on a compilation LP called "Thru The Dark Nightly" by the folk venue Anderson Fair Retail Reastaurant in Houston, where Eric lived for a years. "Virginia's Photograph" a beautiful song about an old woman, looking at an old picture of herself, as a child, and hearing (in her head as she views the photo) her mom or grandmom (I forget) telling her to run in and get on that fancy dress, cause "daddy's gonna take a picture, of us all." "Run, Virginia, put on your fancy clothes, put on your favorite smile, daddy's gonna take a picture, of us all, you know he says they last a lifetime, he says they last a lifetime." I heard Virginia was his school teacher. Michael O'Connor (Slaid's guitar partener) sang it in Paris last february, quite a surprise! That old blues man is Pink Andersen, I guess. If you play guitar, palying Eric Taylor's song is FUN! And "All so much like" is my favorite of his songs. And Happy Birthday Mr Taylor! WOW...really??? So someone out there is covering Virginia's Photograph, that's great, and music to my ears. I don't play guitar, but boy if I did (that sounds so Elton John right now... ), I would love to play a bunch of Eric Taylor songs. For the record I think Ellis would sound great covering Eric's song "Deadwood, South Dakota." I'm such a fan of Eric's, and recommend him, big time. I see over on his website that he's booked to play all over Europe and the UK. Check him out if you can folks, like DonCon said, he should be considered a national treasure. I love that quote. Herve, take care, and thanks for the heads up on Eric's new record, i had no idea he had one coming...will report back in time once I've sat with it awhile. This compilation album also contains Memphis Midnight, Memphis Morning, that was covered by Lyle on his Step inside this House record. To celebrate Eric Taylor's birthday, click here to hear Michael O'Connor's version recorded at la Pomme d'Eve, March 20, 2007. Be patient, it's big! I must have Eric's version somewhere. I'll check! It is so nice to see you here on the board! When I find my specs, i'll add a lil more....thanks again, or should i say merci, beau ceaux.....the album cover for Thru the Dark Nightly. Thanks for that, too. I'll go on record here to say that while I absolutely love the Mucky Duck where Ellis plays frequently -- had the good folks there had other aspiratons, Anderson Fair would have been the place Ellis Paul would have graced the stage in front of Houston audiences...and I'll always wish I'd of had the chance to see Ellis play there, at least once. Again, these files are big! I just ripped the tracks and posteed the links this morning. Sunday mornings in Texas....Ahh.....I surely miss 'em. Find the photo of Shake and Dana and John with the words Vintage Video. It's a really nice writetup on Anderson Fair in Houston where many Texas Artists got their start. The movie about the place is in the works. Noticed that Alejandro Escovedo joined Bruce and band onstage in Houston. Eric Taylor at the Bluebird Cafe in Nashville perrforming Prison Movie. Eric Taylor with Miss Nanci Griffith, somewhere in Texas. Eric Taylor on the road...................got my eyes on Barto, Pa. and Belvidere, NJ. Last edited by paddyinthepub on Tue Mar 17, 2009 8:39 pm, edited 1 time in total. I'm feelin the luck of the Irish today as it's now officially up on Lois and Greg's House Concert myspace that Chuck E Costa will open for Eric Taylor when he plays Lois & Greg’s House Concert in Belvidere, NJ. on March 29th at 130pm. Hope folks near enough can stop by for an afternoon of music by two singer songwriters that both won the prestigious Kerrville Folk Festival's "New Folk" competition exactly 30 years apart. That's right folks, Eric Taylor won in 1977 and Chuck E Costa won in 2007. Here's a link to Lois and Greg's House Concert myspace page. Do I sound excited about this one? So Eric Taylor makes his way to Charlottesville, Va. on the 24th (tomorrow) when he plays the Gravity Lounge. The 25th finds Eric Taylor playing in Annapolis, MD. at the Maryland Hall for the Performing Arts where he will play the songs of Townes Van Zandt. In a unique collaboration of literary, performance and graphic arts, author Robert Earl Hardy & musician Eric Taylor celebrate the life and times of one of America's greatest songwriters - Townes Van Zandt. Hardy reads excerpts from his recent biography "A Deeper Blue: The Life and Music of Townes Van Zandt" interspersed with Taylor performing some of Van Zandt's most famous compositions. An accompanying exhibit of sepia and watercolor wash art by artist Neil Harpe showcases what he calls "Blues Art". The Texas Artists thread would be incomplete without Guy Clark......another old fave. Well, just when you think you know someone. I came across this old news about Eric Taylor from 2004.....so relieved to see it's in fact, old news. Get well wishes to veteran Texan singer-songwriter Eric Taylor who suffered a heart attack on January 30. Really excited to be seeing Eric Taylor in concert this weekend. Eric Taylor took us to church tonight at Landhaven B&B in Barto, Pa.
Just in from seeing Danny Schmidt and Carrie Elkin play out at the amazing Landhaven Bed and Breakfast venue that I easily refer to as a diamond in the rough. The vibe and the sound system are both amazing and it's such a treat to find listening rooms where folks do just that for the entire show. And what a show it was. I'm now acutely aware of the buzz that's been attached to these two fine singer songwriters. They are up this way from their Austin Texas home and strung together a few shows in this region playing Godfrey Daniels last night and Landhaven tonight. What a beautiful and musical night with these two fine, fine singers. Wow! After the show I got the chance to hang out with a handful of folks and watch the end of the road to the finals for the Villanova Men's basketball team. During the commercials got a chance to talk to both of them and you just couldn't meet two nicer people anywhere. I said to Carrie that I thought I had just seen a youtube of her singing with Sam Baker at Anderson Fair. "Odessa" I believe it was? She smiled wide and said oh, yeah, I love me some Sam Baker. She said they sing togeteher as often as possible. That particular time was at Anderson Fair on Valentine's Day and she said they had a nice crowd. It was great to be able to tell her Anderson Fair was like home to me. We got to talking Chuck E Costa and she again smiled wide and said how much she loves his voice and that they are actually about to embark on a string of shows that starts in Cleveland and rolls for a few weeks. Take note to keep an eye on tour dates CUZ Carrie Elkins might be coming your way and she's bringing Chuckie with her. Danny Schmidt -- who knew??? Now I see why the good folks over at Folkwax have his new CD rated so high!!! Wow......the real deal! I think it was through Chuck Costa that I knew Danny was an artist I wanted to be sure not to miss!!! The rest dear friends is such sweet history. Here's a couple Danny Schmidt performances from another show though they are songs he did last night at Landhaven. I found these on Youtube just this morning. Another wonderful weekend of great live music......ain't it great! Last edited by paddyinthepub on Tue Apr 07, 2009 12:07 am, edited 4 times in total. Great couple aren't they? Danny is in the UK soon and I can't go to the concerts that are within travelling distance as I have to work (boo hoo). Looks as if he's coming back in October so hope to catch him then. That FolkWax review was written by Arthur Wood and he is a HUGE fan of both Danny and Carrie. Oh, and after the show and before goodnights were said as we were talking faves I asked her if she ever heard of Radoslav Lorkovic and again she smiled wide. Oh yeah...Rad, she said, they have played together and she said she's always happy to have an opportunity to have him onstage with her. She jokingly added that she tells Rad "look, I can afford to pay you $3 and buy you a sandwich" and that Rad is all too happy. Carrie said she purposely booked some midwest shows so that Rad, who now resides in Iowa, will be able to join her. Karen, of note she said she has a Pittsburgh show lined up with the help of local musician Brad Yoder. Last edited by paddyinthepub on Tue Apr 07, 2009 12:08 am, edited 1 time in total. Here's Danny Schmidt and Carrie Elkin at Anderson Fair in Houston Tx. Danny Schmidt and Carrie Elkin perform Better Off Broke on the Music Fog Bus at Folk Alliance '09 in Memphis.